Long story short: I’m designing a sweater. 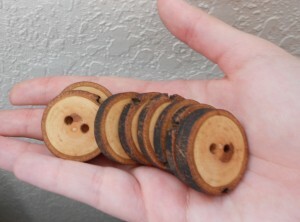 I can’t show it to you just yet, because it is missing a sleeve…but I can show you the amazing buttons I ordered for it. I tried looking for wooden buttons at all of my local crafty places, and the big box stores. 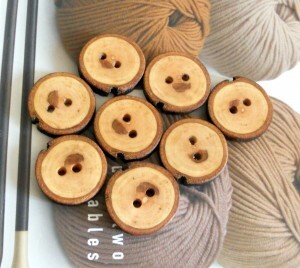 Some places wanted more than $2.00 a button! I normally assume that hand made will cost more than store bought, but not this time. 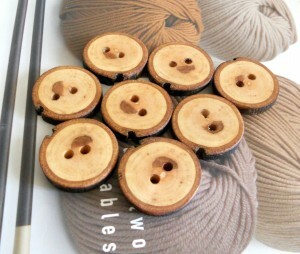 I’m a wooden button fanatic, and I think I’ve found a great place to get them. I’ve linked to the original etsy listing so you can both view the shop and appreciate the photography. And here they are with me! Now I’d better finish that sweater. Admit it…you want these buttons! I found your Brambles hat on ravelry and I am pretty new to knitting I have done one hat with flaps using DPN’s but my mother in law loves your hat design and is an expert at knitting and I would like to know if you could help me better understand the instruction to your patter so that I can translate it for her in Spanish? Leave a Reply to Jefferson Click here to cancel reply.